Brennecke Beach Cottage has some of the best views of world famous Brennecke Beach. We are right across the street from Poipu Beach Park and Brennecke Beach. We provide several boogie boards, beach chairs, and beach towels. For your home entertainment needs the cottage has cable TV, a VCR/DVD player, stereo and stereo and wireless Internet. Indulge yourself in your private Jacuzzi on the spacious lanai (deck), BBQ as you watch the waves, or relax and enjoy the lawn and gardens. You'll also find plenty of fun near home with shopping centers, fine dining and live entertainment nearby. For larger groups, our family owns many of the homes surrounding this home! I miss sitting on the deck, Enjoying a nice glass of wine, listening to the waves and watching the senset... counting the seconds until we can go back !! Thanks! My family and I look forward all year to spend two to three weeks in November at Bob’s beautiful cottage. We just completed our ninth annual stay. As Bob states in his cottage description its “location, location, location”. Every day we see turtles and dolphins from the cottage. Every year we see a few humpback whales that arrive early for the season. The sound of the waves helps us sleep at night. The size of the oceanfront yard is incredible for the area and is all fenced in from the street in front of the cottage. We felt very comfortable letting our two young grandchildren play in the yard. The cottage supplies all the basics, is very clean, has a jacuzzi on the lanai. Steps from the cottage are Brenneke’s Beach and Poipu Beach Park, which are two of the main attractions in south Kauai. I have dealt with Bob numerous times over the past nine years, and he is a wonderful host, and very responsive. I would highly recommend this two-bedroom cottage to all. Our party of four was very impressed with the property that the house sat upon. The house very neat & tidy, the hot tub had been newly installed and was no longer the small hot tub as seen in the picture. Close access to the beach, beautiful sunsets every night. We were scheduled for a one week stay but easily could have stayed for two weeks. Highly recommend this to anyone. The views were spectacular here - like being on a house boat! Was lovely to be able to walk to the beach and see turtles and monk seals every morning. The house had everything you could need, apart from AC. It was tremendously hot and humid which didn’t go down well for our small children and 70 year old mother who vomited from heat exhaustion. We also felt quite exposed and a bit worried about the low wall at the front - both because of our toddler and also for potential foot traffic being able to come on the property. Apart from the heat and slight feeling of exposure, it really was a wonderful place. Beautiful, restful, comfortable, and conveniently located setting, with spectacular views. First impression from all family members: Wow. 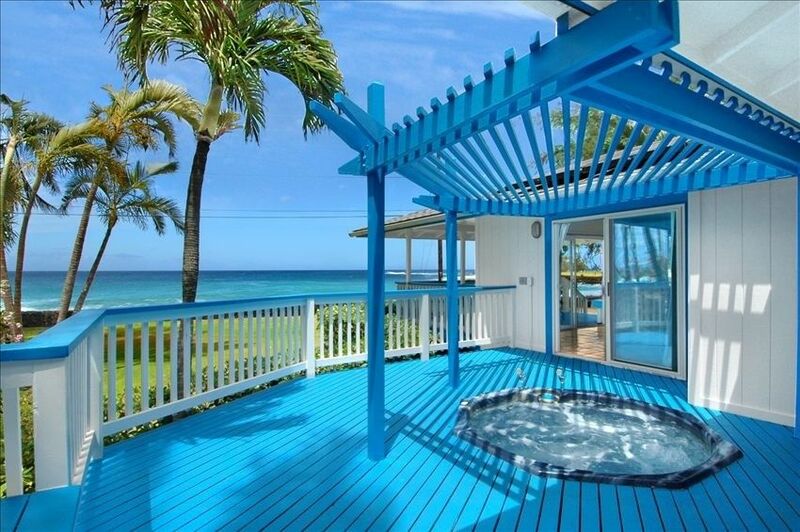 It’s what a beach cottage in the Hawaiian Islands should look like. The Cottage colors echo the blues and whites of the surf and sand it views. The grounds are well kept: large lawn area, Palm trees, and omnipresent resident egrets. It sits directly across the street from a bodysurfing beach, Poipu picnic grounds with its varied Palm trees, and it is a five-minute walk to Poipu beach and adjacent coves were surfing and paddle boarding services are available. The cottage sun lit rooms with large viewing windows givea a spacious feeling as if you were outdoors. All rooms are tastefully decorated, furnished, and spacious. Snorkeling, boggie boarding, and beach chairs are available on the back porch. There were plenty towels for showers and the beach. A hot tub is present if you just want to sit and take it all in. We liked that this cottage was quiet and provided a feeling of privacy (unlike packed major hotels in the area). The Brennecke Beach Cottage is a beautiful setting. If you want to get away, rest, and find your Aloha, this is as good a place as any to start. Our damage deposit is $250.00 and is required at time of booking.